Get instantly notified by e-mail when ASUS ROG Maximus XI GENE Motherboard is available for pre-order ! With industry-first support for double-capacity DDR4 memory, comprehensive cooling and four M.2 slots for unthrottled SSD RAID storage, Maximus XI Gene lets you maximize the power of your SFF rig to achieve the performance of high-end ATX systems in a much more compact package. Whether you’re gunning for high memory frequencies or tuning timings for the lowest latency, ROG Maximus XI Gene provides the tools you need to exploit the Coffee Lake architecture’s full potential: carefully optimized trace pathways maintain signal integrity, and the acclaimed ROG firmware offers the necessary tweaks to ensure stability while maximizing memory performance. Load up with a high-density memory kit for heavy multitasking, or run a focused setup that delivers the bandwidth your favorite games and applications need. Any way you stack it, the Gene has you covered. Maximus XI Gene features a unique memory-trace design that supports up to 32GB per channel for a total memory capacity of 64GB. With double-capacity UDIMM modules, Maximus XI Gene delivers four-DIMM memory bandwidth in a compact, dual-DIMM design. By default, all of Coffee Lake’s major bus frequencies are derived from the same reference clock, limiting the control and flexibility needed to harness the full overclocking potential of the platform. 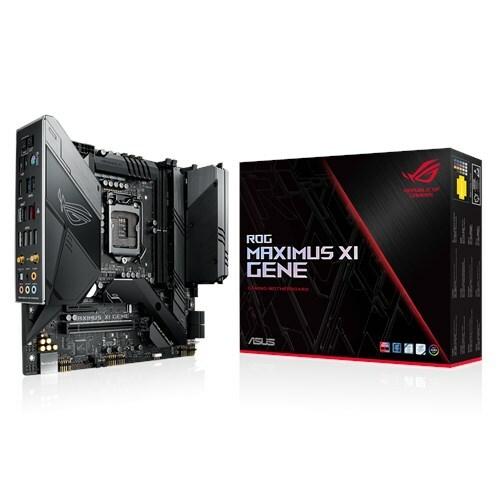 ROG Maximus XI Gene features a dedicated onboard clock generator that supplies dynamic reference clocks to the CPU cores and major subdomains, giving you the freedom to coax every MHz of headroom from the system. Maximus XI Gene comes equipped with four M.2 slots to let you take full advantage of Intel IRST and NVMe RAID for ultimate SSD storage speeds. Two M.2 slots on the ROG DIMM.2 module, an innovative expansion card that allows connections via a DDR4 interface, while the other two M.2 slots under the M.2 heatsink connect via PCIe 3.0. ROG Maximus XI Gene features the most comprehensive cooling controls ever, configurable via Fan Xpert 4 or the UEFI BIOS. The Maximus XI Gene has provision for four M.2 drives to make the most of Intel’s IRST options. Two ride our DIMM.2 module next to the memory slots, while two slots under the extended M.2 heatsink. ROG DIMM.2 module is an innovative expansion card that allows two M.2 drives to be connected via a DDR4 interface. You can then add a metal heatsink , helping to control thermals for maximum performance while elevating the asethetics. ROG provides the best firmware and utilities to give you complete control of your system. With powerful overclocking via the acclaimed UEFI BIOS or automatic 5-Way Optimization, audio profile tweaking and intuitive tools to optimize storage, audio quality and networking performance, Maximus XI Gene comes with everything you need to customize your experience exactly how you want. Take care of complex tuning with just one click. ASUS 5-Way Optimization is a system-wide tuning utility that overclocks the processor and tunes fan speeds to ensure the best balance between cooling and acoustics. The automated CPU tuning feature of 5-Way Optimization leverages the same onboard intelligence as AI Overclocking,but goes further by running a Prime95 based stress test to deliver a result that’s well-tuned from the get-go. Immerse yourself in sound with SupremeFX audio technology. Utilizing the S1220A codec, SupremeFX is the integrated-audio solution that’s engineered to provide a flat frequency response for a neutral, detailed sound signature. And to ensure that pristine signature is perfectly preserved, the front-panel output is driven with dual op amps, delivering sonics with the scale and authority to create virtual worlds via your gaming headset. ROG works extensively with industry partners and performs extensive testing to ensure Maximus XI Gene provides seamless compatibility with a wide range of graphics cards, DRAM modules, coolers, cases and other components and peripherals. Together with AURA RGB lighting that synchronizes with a vast ecosystem of compatible products, Maximus XI Gene is primed for endless personalization.